As we return to the South Shetland Islands as fully fledged explorers and after another peaceful afternoon kayaking, this time alone in my kayak in the cleanest, calmest sea we’ve been in, all of us wear a new confidence, and maybe some a new faith. We still have the dreaded Drake Passage re-crossing ahead of us, but we trust our captain will get us back to land, even though many of us are hesitant to leave this relatively undisturbed place of beauty and drama. Next to weather and penguins, I’ve learned so much about ice. It’s what you see daily when you look out the porthole and you photograph it like it was your grandchild - with delight and longing. Remember, it is never the same. You could pass by the same islands a week from now and the formations would be relatively different, the glaciers would have crumbled and wrinkled even more, and the seas would possibly be chocked full of new iceberg wedges and sea ice. They say that once Antarctica was a temperate green area. The warm waters from what is now Brazil warmed it so that even beech trees grew here, about 25 million years ago. Fossils have been found that imply certain warm - climate animals lived here. It’s a huge continent - bigger than the USA and Mexico combined and just as varied, but most of us think of it as a giant blob of ice holding up the south pole. Scientists and naturalists refer to it as "The Big Ice." The winds may be ferocious but the silences are heavenly. (There are no airplanes flying overhead. There are no boom boxes polluting the sound waves. Only the thunder of crashing glaciers moves the air.) And ice forms, rearrange, drop, rise and float according to the seas, temperature and wind. The shape of Antarctica's continent resembles a brain with a tail, which is the peninsula we have been exploring. It was last to break away from mainland South America. On the opposite side of the continent from our excursion is the access to McMurdo Station, operated by the USA, and directly south from New Zealand. Here is where the Today Show centered its program. Ninety per cent of all ice on the planet is in Antarctica, so much ice that the bottom of the earth is flattened by its density. There is nothing green now, except in mid summer when algae form under the ice’s surface from plankton and other single cell organisms that temporarily feed the animals. Ninety-six per cent of Antarctica is covered in thick ice - the four per cent left would be the exposed rock of the mountains and volcanoes. Because of the inaccessibility, nothing much is known about the geology of Antarctica - although there are suppositions that all sorts of minerals and precious metals are underground. There exists a zone on the continent not far from the actual South Pole called No Man's Land because no man can reach it. Then there is the issue of real and imaginary south poles - the historical one and the geomanetic a number of miles to the east. Ice begets ice. Ice of the interior becomes ice of the seas, our geologist explained. Ice is a crystal. And snowflakes, tiny as they are, are its seeds. Actually Antarctica is the largest desert on earth. The continent proper probably receives only two and a half inches of new snow a year although it is constantly snowing. But it stays and one and a half feet of snow produces one inch of ice. Air pockets and density pack ice tight. It takes 10-15 meters of snow to form glacial ice and 50 meters of ice for the flow to begin. In East Antarctica, the ice sheet is 4-5000 meters thick. And, unlike the Northern hemisphere, it is not melting. What makes one's mouth drop are the incredible colors of blue and turquoise that seem to paint the glaciers in their progress down to the seas to meet the magnificent plateau icebergs already there. The blue depends on the density of the ice which reflects the light. White normally reflects all colors but in this case the blue stays with the white ice because of air pockets. Some of it looks like taffy, others like divinity candy we used to make at Christmas. There is ice lingo, too. Fast ice, pack ice, icebergs, ice islands, ice cliffs, sea ice (a skin of sea ice surrounds the continent separating the sea from the glaciers. There are about 7.8 million square miles of sea ice in Antarctica. One expert said it chills the hemisphere by reflecting sunlight back to the sun which would otherwise warm the sea.) Fast ice grows out from the land or forms continuous ice sheets, and pack ice is made up of ice floes or broken remnants of ice sheets. 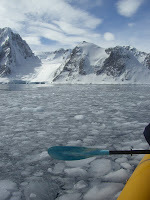 We spend long hours nosing through ice floes, even when paddling kayaks. It’s easy to get the rudder stuck on a hard ice floe although most of it breaks off in time. Pancake ice is part of the second stage of sea ice formation and forms irregular discs that look like pancakes because as ice rubs together it forms little raised edges in a circle. Polynyas is when the wind and currents part the ice and make stretches of open water with ice fields. These continually open and close so a channel we might be able to move through with ease today, tomorrow will be chocked up tight and prohibitive. But what awes are city-sized glaciers moving down rock mountains, and from which we must stay away because when they crash, it’s like the demolition of the Baptist Hospital or a skyscraper. It’s called calving. As they hit the waters, giant waves wash up to whatever shore is in view. The same with icebergs. To me icebergs are God’s floating sculptures. You want to photograph each one because, in reality, it changes every hour as the summer sun begins to melt them. I'm reminded of the British artist William Goldsworthy's environmental pieces. 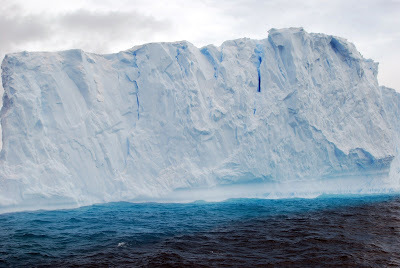 There are tabular ice bergs which break off from the glaciers or mainland ice - like blocks in a puzzle or like giant sections of the Grand Canyon separating from cliffs. They will continue to float for years and are named by scientific observers. One called B-15 is 75 miles long. It was caught up in the counter clock wise flow of the sea and has now floated around the entire continent and is lodged near Elephant Island. These tabular bergs can stand for decades because the sea water is so cold. There also exist lesser bergs, bergy bits, growlers and brash ice, which are irregular in shapes and molded by the sun breaking from glacier streams moving down the mountains. There is anchor ice which is attached to the bottom of the bay or sea; Firn, which is old snow recrystallized into a dense material; frazil ice - fine spicules or plates of ice suspended in water; grease ice - a soupy layer giving the sea a matt appearance hummock and bummock (look that up in the dictionary); ice blink; moraine or rocks transported in ice; nilas or thin crust of floating ice easily bent by swells and waves; old ice, which is more than two years old and up to 10 feet thick; rotten ice which is honeycombed and in an advanced stage of disintegration -- well I could go on forever. In the waters where we kayaked, I noticed broken ice itself has three appearances - clear ice like we drink in our ice tea or if you are like me, eat continually in hot summer hours; white ice which is full of snow and is opaque, and black ice which is the hardest ice and the most dangerous. It looks like coal. You don’t want to tackle a chunk of black ice in a kayak. Believe you me. It is fascinating, this world of ice, and I cannot stop taking pictures. Now this continent doesn’t seem so cold because it has heart. I’ve been able to embrace the ice, slip on it, fall on it, eat a bit of it (very salty) and throw snow balls of it and survive., It’s amazing what a tiny snowflake can become. Does that give you any faith? Please note: this is not Hollywood, not Disney, not even Evian. But Antarctica, all of it, is the most pristine and rich frontier that’s left on the earth which has still not been destroyed by man. We must support the efforts to keep man’s boot prints and heavy hand at bay. Yesterday, after passing colonies of stinky, noisy, precious penguins, and a couple of lethargic obese seals on the snow, many of us climbed a 500 foot hill for a view. A few decided it would be fun to slide back down on their rears or spread eagle. They screamed and shouted and yelled. My heart twisted and I thought, something is wrong here. Do the animals understand us? We don’t fit in this place. We are invaders and guests. 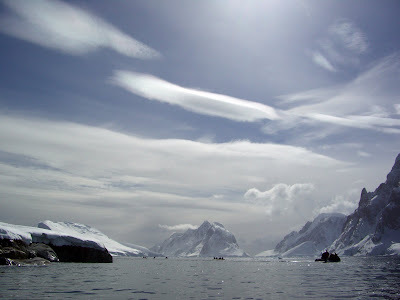 This land belongs to the patrons of ice, the penguins, seals, birds, sea whales of Antarctica. I’ve been blessed with the privilege of passing through here, but I must keep on going, as we all must. And I pray that those who have the authority and power over Antarctica will keep it simple, limit the boot prints, study it, preserve it, but in no way attempt to conquer it. It’s God’s berg and He is here.